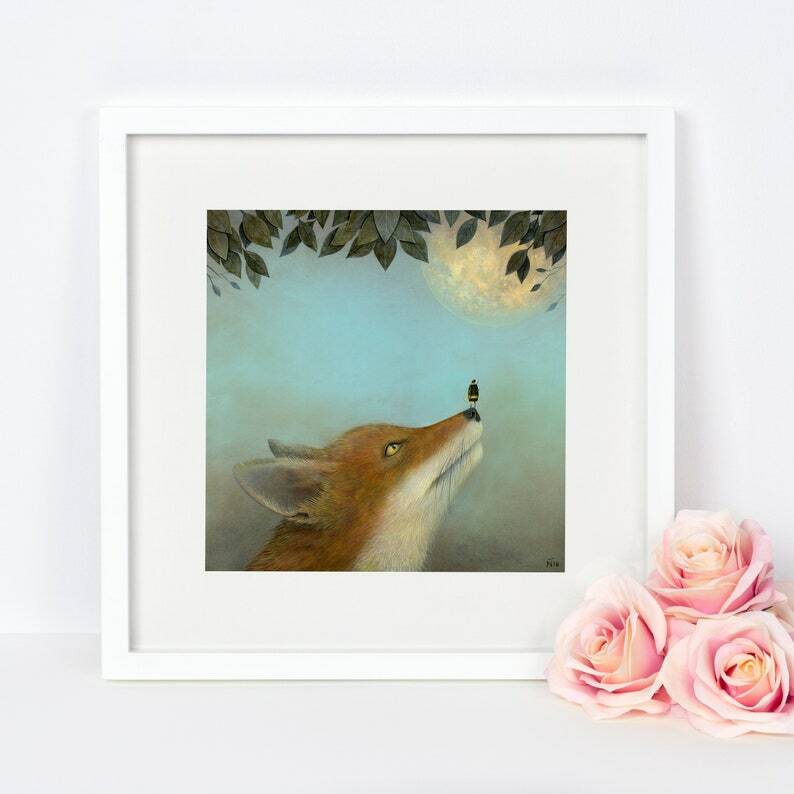 10% of the proceeds of this print go to the National Fox Welfare Society. 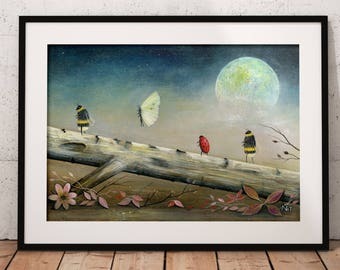 This is a fine art print taken from my original acrylic painting 'Touching the Moon'. Every print in my shop comes from an individual painting of mine. Fine art prints make beautiful and unique additions to your home. They also make appealing and distinctive gifts. As an artist my prints are only available through my Etsy shop, my website, a limited number of independent bespoke shops, and fine art galleries. Each print is signed by me. All prints are produced to the highest quality using Innova Natural Soft Textured 315gsm Fine Art Paper and Epson Ultrachrome HD pigment inks which will ensure a print life of more than 85 years. This print is supplied mounted and cellophane wrapped ready to fit standard size frames. Please note that all frames and props used in product images are for display purposes only. Frames and props are NOT included in your order. Permission must be granted to copy all or part of the art work. This art work may not be sold, duplicated on other websites, incorporated in commercial products, or used for promotional purposes in any manner without my express written permission. Buyer is not purchasing the rights to the image. I accept payment via PayPal, credit cards, debit cards and Etsy gift cards. All prices are listed in £ (GBP). I happily accept returns, exchanges and cancellations. Please contact me within 14 days of delivery if you wish to return or exchange your item. Item must be shipped back to me within 30 days of delivery. Proof of postage will be required incase item goes missing in transit. I am happy to cancel your order if done so before the item has been shipped. Buyers are responsible for return shipping costs. Item must be returned in it's original condition. Items ship within 1-4 business days of received payment. Orders in the UK are sent either first or second class, depending on size and weight, by Royal Mail. Please note Royal Mail do not deliver on Bank Holidays and Public Holidays. International Shipping is sent either first or second class, depending on size and weight, by Royal Mail. Delivery usually takes between 2-4 weeks. Customs and import taxes. Buyers are responsible for any customs and import taxes that may apply. I'm not responsible for delays due to customs. I always receive proof of postage once package has been dropped off at the Post Office. Please make sure your Etsy & Paypal addresses are the same. If the addresses differ your purchase will be shipped to your Paypal address. I am happy to provide my products wholesale. Please send me a message for further information. I am happy to provide stockists with my products on a sale or return basis. Please message me for further information. I accept private commissions of original paintings, on the condition that the painting you require is of a similar style and subject to my other paintings. I am more than happy to discuss requirements, just send me a message if you'd like any further information.